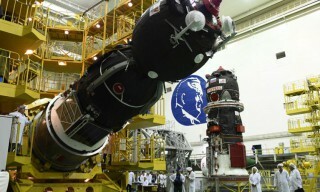 The author’s inspection of the “Soyuz MS-10” spacecraft and rolling the head fairing were carried out. 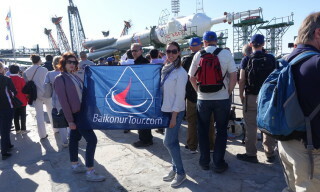 Today, on October 3, RSC “Energia” specialists at the Baikonur cosmodrome conducted a design inspection of the “Soyuz MS-10” spacecraft and performed technological operations to roll up the head fairing of the “Soyuz-FG” launch vehicle. 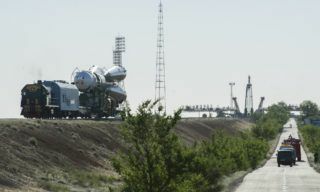 The preparation of the spacecraft for launch under the International Space Station (ISS) program is carried out in the spacecraft installation and test building at the Baikonur cosmodrome. On October 1, RSC "Energia" specialists at the Baikonur cosmodrome completed a set of technological operations for docking of the "Soyuz MS-10" spacecraft with a transfer compartment. According to the schedule of the preparational works, on October 3, the ship will be inspected and the head fairing will be rolled. The launch of the "Soyuz-FG" launch vehicle with "Soyuz MS-10" spacecraft with the crew of the next long-term expedition to the International Space Station is scheduled for October 11, 2018 from the Baikonur cosmodrome. 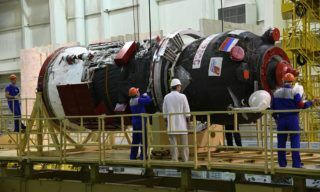 According to information from RIA NOVOSTI (ITAR-TASS) - The Space Corporation “Energia”, after a state of emergency with an air leak at the International Space Station (ISS), will check for the presence of traces of the drill all the spacecrafts “ Soyuz” and “Progress”, that are in storage at the Baikonur Cosmodrome and the” Soyuz” and “Progress” spacecrafts, that are in storage near Moscow. 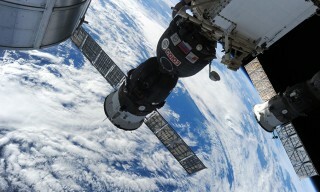 The air leak on the ISS was found on the night of Thursday, 30 August. 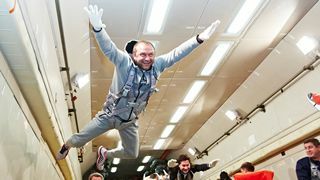 The crew found a "micro crack" in the living compartment of the “Soyuz MS-09”. 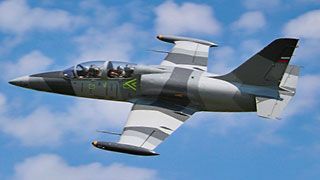 Another agency source said, that the employee, who performed a defect, closed the hole with a special glue, that was not found during the tests before the launch. On Monday, RSC ”Energia” began an internal investigation concerning the fact of negligence in the production of the “Soyuz MS-09”. September 2, 2018 marks the 110th birthday of academician Valentin Glushko, a Soviet engineer, scientist, one of the pioneers of rocket and space technology, the founder of the Soviet liquid-propellant rocket engine. 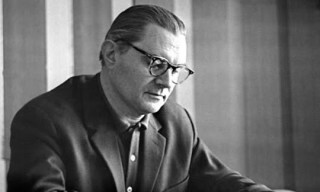 As the general designer of “NPO Energia” and chairman of the Board of Chief designers, in 1974-1989, Valentin Glushko carried out a general management of the works of numerous enterprises and organizations on key projects of Soviet manned space flights. Specialists of RSC Energia launched a new series of experiments to evaluate the man-machine interface of "Federation" spaceship. Information management formats are what is displayed on the cosmonaut's console: a pictorial representation of on-board systems, processes and flight modes, as well as signaling and commands that the crew can issue. In the plans of specialists - working out all modes of the ship's flight: from launching to docking and transition to the flight path to the Moon. Today, July 17, 2018, "Roskosmos" State Corporation has signed a state contract with RSC "Energia" for the creation of a new-generation middle class space rocket complex with a "Soyuz-5" carrier rocket. 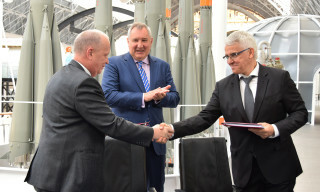 The document, in the presence of the General Director of "Roskosmos" Dmitry Rogozin was signed by Nikolay Sevastyanov, First Deputy of General Director of the State Corporation "Roskosmos" and General Director of RSC "Energia" Sergey Romanov. These works of RSC "Energia" should be carried out in cooperation with enterprises, that are part of the "Roskosmos" state corporation. Specialists of “Roscosmos” enterprises at the Baikonur cosmodrome successfully performed operations for refueling the “Progress-MS-09” transport cargo vehicle with fuel components and compressed gases at the filling station. 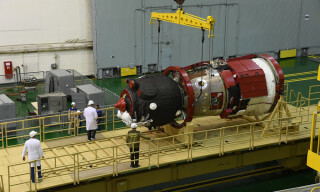 After refueling, the ship was delivered to the test facility of spacecraft and installed in a jig for the completion of the final training operations. The launch of the ”Progress-MS-09” cargo vehicle by the “Soyuz-2.1a” carrier rocket from the platform 31 of the Baikonur cosmodrome is scheduled for July 10, 2018. Roscosmos. “Soyuz – FG” rocket with the “Soyuz MS-09″ spacecraft launched from the Baikonur cosmodrome. 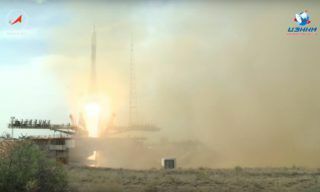 Today on June 6, 2018 at 14:12 (Moscow time) at Baikonur cosmodrome from the launchpad № 1 ("Gagarinsky start") launched a carrier rocket “Soyuz-FG” with a "Soyuz MS-09" spacecraft. 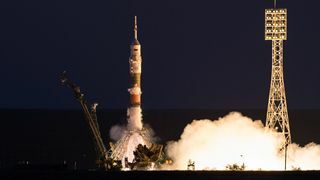 After 8 minutes and 48 seconds, the ” Soyuz MS-09” spacecraft was completely separated from the third stage of the launch vehicle in a given near-earth orbit and continued its autonomous flight to the International Space Station under the supervision of specialists from the Russian Flight Mission Control Center. On June 4, 2018, at the Baikonur cosmodrome, specialists of Roscosmos enterprises rolled out to the launch site a “Soyuz-FG” carrier rocket with a “Soyuz MS-09” spacecraft. 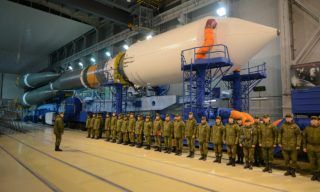 After the rocket was installed in the launch system and the service farms were attached, the specialists of the Roscosmos enterprises started to work according to the schedule of the first starting day.